Apple previewed its latest vision for mobile news publishing on Monday with an app simply called News, powered by high-profile partners like ESPN, CNN, Conde Nast, and The New York Times. The app aims to be a personalized news reader by serving up stories that it thinks the user will be interested in. It will start to appear on iPhones and iPads in the fall, giving the partners a new way to reach hundreds of millions of potential readers. Apple has been in talks with the participating news organizations for a number of months. 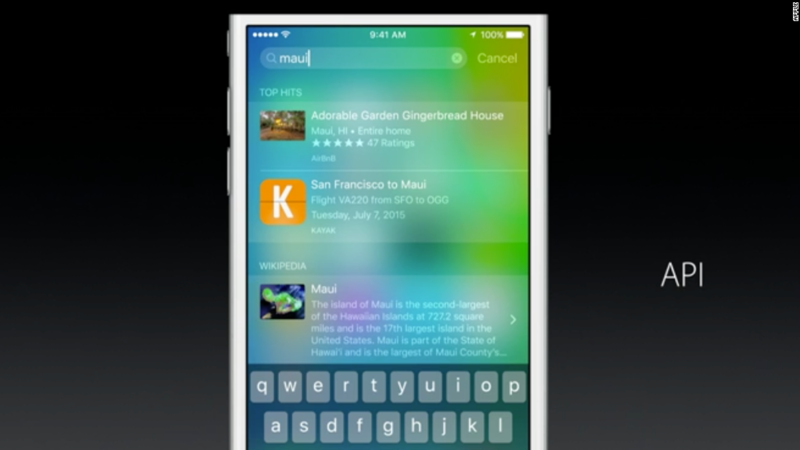 Some of them were named on Monday, when the app was announced during Apple's Worldwide Developers Conference keynote. "We already have nearly 20 publishers representing more than 50 titles joining us, including Condé Nast, ESPN, The New York Times, Hearst, Time Inc., CNN and Bloomberg," Apple senior vice president Eddy Cue said in a press release. CNN is the parent company of this web site. In an internal memo, CNN chief product officer Alex Wellen called the new app a "mobile reader" that will "be a powerful distribution channel for CNN's signature design and multimedia storytelling." The News app is one of many competing solutions to a significant problem for news organizations: How to reach mass audiences on mobile devices. Last month Facebook began testing Instant Articles, a new format for stories published directly within the social network's mobile app. Facebook has a set of initial partners, just like Snapchat, which gained a lot of attention when it started to publish news stories and entertainment from big brands inside its app in January. Apple (AAPL), Facebook (FB), Snapchat, and a swath of other companies all want to offer visually arresting storytelling formats that appeal to journalists -- and equally exciting formats for advertisers as well. Apple said its app will combine "the visually rich layout of a magazine with the immediacy and customization of digital media." Industry analysts immediately pointed out the new app's similarities to Flipboard, which aggregates news from a wide variety of sources and presents it in a magazine-style series of pages. If it gains a wide following, the app will make Apple even more powerful in the news ecosystem. Big magazine companies are among the early participants. Condé Nast titles like Wired, Bon Appetit and Vogue appeared on-screen at the Apple event. So did Hearst titles like Cosmopolitan, Elle and Town & Country. Other publishers that are on board include the Daily Mail, Politico, The Economist, Buzzfeed, The Atlantic, New York magazine, The Guardian, and Vox Media. The participating Vox sites are Vox.com, The Verge, Racked, Eater, Polygon, and SB Nation. Brands like The New York Times and Bloomberg said they would make some, but not all, of their daily news output available through the News app. The app will encourage subscriptions, in some cases, and earn revenue for the news outlets through advertising.